In the B2B world, making a sale depends almost entirely on the relationships you build. If you’re unable to sustain a strong relationship with the right influencers within a company, your chances of landing a new client can be slim. However, connecting with these decision makers in the first place isn’t always easy. In order to make the relationship-building process easier, you can use a technique known as ‘leveraging’ to boost your connections. Through leveraging, you can use the relationships you’ve already established to make a better connection with the individual ultimately in charge of purchasing decisions. This can help you improve your chances of a sale. Let’s take a look at what leveraging actually is, and how you can apply it to your B2B sales strategy! Leveraging enables you to connect with influencers, in an attempt to make stronger connections with a decision maker. Establishing a relationship with an influencer lets you get your foot in the door more easily. An influencer can help establish trust with the decision maker, improving your chances of success. In the world of business-to-business sales, success comes down to who you know. If you want to land a sale with a new client, you need to get your name, brand, and products or services in front of the right person. Unfortunately, connecting with a decision maker the first time around isn’t always easy. If you can’t get your foot in the door one way or another, your efforts to reach your customer may go ignored. ‘Leveraging’ is a sales process that solve this problem, by helping you establish a strong connection with someone who influences the decision-maker. While this ‘influencer’ may not have the authority to make a purchasing decision, they do hold weight with the person ultimately in charge. This means they can help get your products or services in front of the right of people, and increase your odds of landing a sale. Leveraging is most useful if the person in charge of purchasing decisions isn’t the actual end user of your products or services. For example, if a CEO or CFO needs to sign off on the purchase of a product that doesn’t directly influence their day-to-day activities, it can be difficult to convince them why your offering is necessary. However, if you connect with the team who would benefit most from that product, you can get their help in pushing for a sale. Let’s take a look at the four steps you’ll need to follow, if you want to apply leveraging to your B2B sales strategy. Before you can begin the relationship-building process, you need to identify who the decision maker is for the company you’re targeting. This is the individual who has the ultimate say in purchasing decisions, meaning they will need to sign off on your product or service. Keep in mind that the decision maker is not always the person who will ultimately use your products or services. Who the decision maker is will typically depend on the business’s size and industry. However, it is often a company’s CEO or CFO, or a Vice President of a particular department. Although this person may be in charge of making the final purchasing decision, they typically don’t make that choice entirely on their own—which is where influencers come in. After you’ve identified who your decision maker is, you want to consider which individuals within the company might influence their choices. Influencers are typically employees without direct purchasing power, but whose opinions are trusted and valued by the decision maker. This means they can suggest or recommend products and services to the person in charge, and they’re likely to be listened to. Influencers can hold many different positions. They might be a decision maker’s assistant, a manager, or a Vice President of a department, and there may be more than one of them. However, you want to consider which influencer will receive the most benefit from your product or service. An assistant might hold a lot of weight with a decision maker, for example, but if they can’t see your value they can be a waste of time to connect with. Therefore, consider which people or team at the target company would use your service the most, and determine which individual in that group is closest to your decision maker. You’ll then want to try and contact that influencer through direct outreach, social media, and other targeted marketing techniques. An influencer isn’t likely to introduce you to the decision maker after your first connection. If you want to encourage them to go out of their way to help you land a sale, you need to establish trust first. This means you need to focus on consistently showing the value you and your business can provide. In B2B sales, you want to consider the direct impact your products or services would have on the influencer. This includes how you can make their personal or professional life easier. In order to build your relationship, you need to have a strong marketing funnel that can turn your leads into loyal customers, but you also want to focus on establishing a one-on-one connection. This means reaching out and having real conversations with the individual you’re trying to connect with. Be sure to carefully listen to what your influencer tells you. While you may think you understand their problems and goals, you might be mistaken. Pay close attention to their needs and pain points, and do what you can to show that your products or services can help alleviate those specific issues. When your relationship with the influencer is finally established, and they’re on board with your products or services, you’re ready to connect with the decision maker. At this point, your influencer should be ready to make an introduction, and to push for the services you’re offering. In order for the transition to go smoothly, you want to have the influencer convinced that your products or services are right for their business. When the influencer is on your side, they can better explain to the decision maker the unique pain points they experience in the workplace, and how your offerings will make their workflow easier. From there, you can discuss the additional benefits of your product or services, with the goal of convincing the decision maker to buy. If you’re going directly to the decision maker when trying to make a sale, you’ll often have a hard time getting them to notice you. Instead, you can leverage your relationship with a key influencer to help get your foot in the door. Plus, you’ll then have someone on the inside pushing for your product or service. Identify the end decision maker. Find the right influencer to target. Create a strong relationship with the influencer. Use your relationship with the influencer to connect with the decision maker. 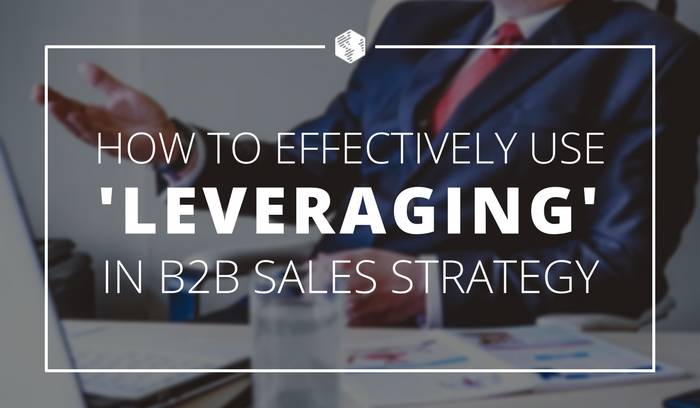 How do you think leveraging will help boost your B2B sales? Let us know in the comments section below!